When the iPad2 first came out, we played with a bunch of ideas to get the sound around to the front where we were when viewing the screen. 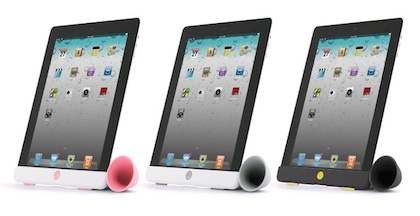 Of course, you can cup the lower part of the iPad2 in your hand and the sound will direct around ‘louder’ to you… so we knew there was a natural way we could do this without the need for power. The folks at FruitShop appear to have had the same thought. 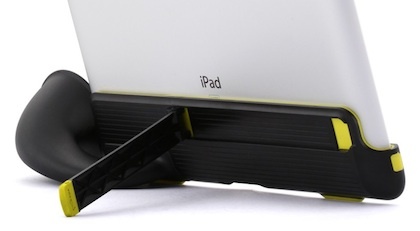 The have created a bit of plastic that slips over the bottom of the iPad2 and has a horn out the side. Not like our design but looks like it should work just fine. It doesn’t really supercharge the column output, but 15 db increase is nice. Since you are not worried about wires for a powered speaker system, this will work anywhere and with the iPad2 in portrait or landscape view. They are even offering it in three colors. The ‘Horn Stand‘ is just that too, a stand. You don’t have to carry power cords or a stand and speaker. Fun stuff, looking forward to trying them out around the office.